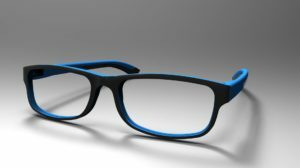 Dallas, TX, February 28, 2018– PHTL will be presenting its first of a kind Smart Reading Glasses, The Dynfocals, at Vision East show held at Javits Center, New York from March 16-18. The Dynfocals has been awarded the CES Innovation award 2018 in the wearables category. This prestigious award is judged by a preeminent panel of designers, engineers and trade media to honor cutting-edge products with outstanding design and engineering. The Dynafocals is a dynamic focus eyeglasses that changes the focus for the user based on what is viewed by him or her. The user could clearly see distant objects, computer screen or near-print just by looking at the object. Using the distance sensing chip and standard progressive lens, the frame position is adjusted to bring focus to users view. If a user is working on the computer, it is detected by Dynafocals, and the frame nose-pad is adjusted to bring the near focus area of the progressive lens into user’s view. It is an excellent solution for desktop usage or other daily activities. Presbyopia through ages has remained a challenge for billions with near vision. The invention of glass lens was a big boon for older people to reclaim sight for close objects. The bi-focal or Progressive lens was the next advancement to improve the life of the people with Presbyopia. Both these solutions have their limitations. Dynafocals provides a complete solution for presbyopia in a sleek, comfortable and affordable pair of glasses. The user can carry out their daily routine without the need for swapping glasses or head contortions to achieve perfect focus. PHTL will also be showcasing its Smart Glasses with integrated Alexa, speaker for private music/call, notification alerts and pedometer. These glasses will come in Sunglasses and prescription frame formats. They are designed with swappable front and modular temple design. With all the electronics and smartness in the temples, they provide flexibility with fashion for the user. With nine awarded patents and patent pending for Dynafocals and Smart glasses, PHTL has designed many innovative products in wearable space. If you would like more information about this topic, please contact Shariq Hamid at 214.504.2263 or email at shamid@phtl.com.